Mamadou Thiam of ASC Touré Kounda, currently number 13 in the Ligue 1 of Senegal, has been one of the revelations of the season. ASC Touré Kounda is a newly promoted club from Mbour, a city in the Western parts of Senegal with almost 200 000 inhabitants. Thiam is a former player of Stade de Mbour, traditionally the best team from Mbour. However; Stade de Mbour was relegated after the Ligue 1 2010, winning only one match during the season and scoring only 10 goals in 16 matches. Thiam was in and out of the team during the season and as far as I know, he failed to score any goals for his club. Thiam was also part of Stade de Mbour in the Ligue 1 2009 but it is difficult to find information about his performances this season. He did however score at least one league goal. Before the Ligue 1 2010-2011 kicked off, newly promoted ASC Touré Kounda decided to sign several players from their relegated neighbors, including goalkeeper Mahame Sow, defenders Ame Diallo and Abdoulaye Kama, midfielder Bécaye Diallo and the rather unknown striker Mamadou Thiam. The signing of Thiam has proved to be a stroke of genius. Thiam started the Ligue 1 2010-2011 in sensational fashion, scoring four goals in his first three matches. At the time of writing, Thiam has scored six goals in ten league matches, quite impressive numbers in a league famous for producing few goals. Thiam has actually scored 60 percent of all the Touré Kounda-goals so far this season. In January 2011, Thiam was included in a combined preliminary squad for the Senegal B and Senegal U-23 national football team. The Senegal B national football team was preparing for the Orange African Nations Championship (CHAN) that was played in Sudan in February 2011. Thiam did not make the final squad of Senegal B for the tournament but is currently an established member of the Senegal U-23 national football team. ASC Touré Kounda won the Coupe du Sénégal in 2010 and therefore got a place in the Orange CAF Confederations Cup. ASC Touré Kounda knocked out Ports Authority from Sierra Leone in the preliminary round but eventually lost to FUS de Rabat in the first round. Thiam made some impressive performances against the strong Moroccan side and proved that he could handle such a high level of football. Mamadou Thiam is primarily a center forward but can also play as a winger. He is known to be a very skillful player with a great physical presence and is the kind of player who can both create chances on his own, often attacking from the deep, but also be a “fox in the box”. Thiam seems to be a modest young man with his head at the right place. In interviews he has often given credit to the good passes he has received from playmaker Dame Diop and his striking partner Pape Moussa Konaté. His full name is Mamadou Touré Thiam. According to some sources, Thiam is born 04.04.1989. Most sources seem to agree that Thiam is born in 1989, which I personally think is correct. Thiam has taken tremendous steps during the last ½ year and could very well head for Europe soon. Actually, his progress is somewhat similar to the progress the former ASC Diaraf-striker Dieylani Fall experienced before he eventually signed a professional contract with AJ Auxerre of France in January 2011. 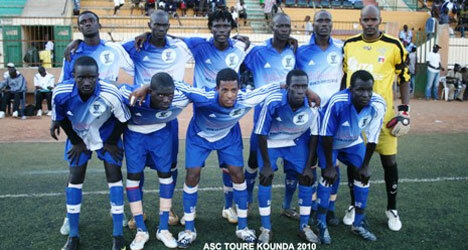 The picture is taken from topsports.biz and shows the whole team of ASC Touré Kounda.